The HP 91 Yellow Ink Cartridge contains 775 ml of ink and is compatible with HP Designjet Z6100 & Z6100ps series printers. 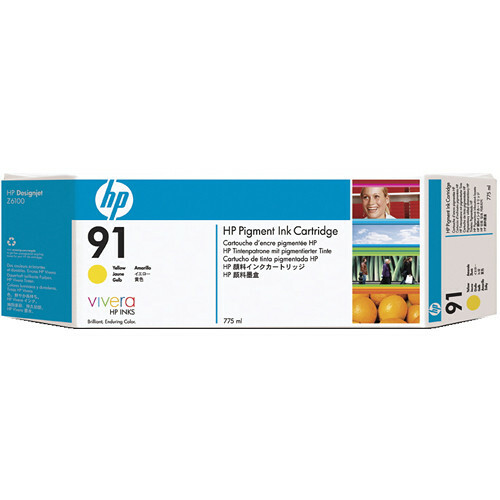 Box Dimensions (LxWxH) 12.6 x 4.75 x 2.1"
91 775-ml Pigment Yellow Ink Cartridge is rated 3.0 out of 5 by 1. Rated 3 out of 5 by david f. from HP setting expiration dates for perfectly good cartridge? These work fine until they reach their expiration, at which point the printer throws an error.